Weight Loss Surgery > Primary Care Physician Portal > What's Best For My Patient? What's Best For My Patient? Which procedure is best for my patient? Inform your patients that the type of procedure they choose depends on how much weight they want to lose, their current health, which procedures their insurance covers, and their overall weight loss goal. Involves stapling the stomach and re-routing the small intestine to form a small stomach pouch about the size of an egg. During surgery a limb of the intestine is attached to the pouch to create a bypass. 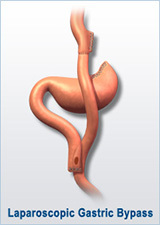 After surgery, food enters the pouch and empties into the small intestine. 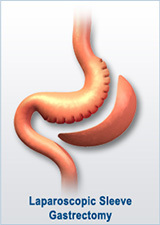 The end result is that food bypasses almost all of the stomach and a segment of the intestine. Pro: Patients will feel satisfied eating smaller food portions because their stomach can only hold a small amount of food. Con: This procedure is technically more challenging to perform than other restrictive procedures, so there is room for more complications during surgery. A non-reversible procedure that reduces stomach size by 85 percent by generating weight loss solely through reduced food intake. During surgery the stomach is divided vertically and a portion of the stomach that remains is shaped like a very slim banana or sleeve, which measures from 1 to 5 ounces. 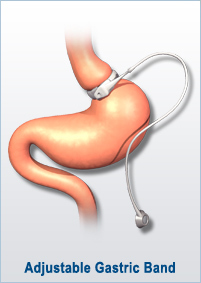 Pro: The same as laparoscopic gastric bypass surgery. Patients feel satisfied eating smaller portions of food. Con: This is an irreversible procedure, and because it involves stapling, leaks and other complications can occur. Helps patients lose weight by reducing the capacity of the stomach, which restricts the amount of food that can be consumed. During surgery surgeons make small incisions to implant an inflatable silicone band into the patient's abdomen. The band is fastened around the upper stomach to create a new, tiny stomach pouch that limits and controls the amount of food eaten. Pro: Does not involve cutting or stapling the stomach, and it is completely reversible. Con: Frequent postoperative visits to adjust the band. Other risks include band erosion, gastroesophageal reflux, esophageal dilation and dysmotility.